Spinach is the bane of most children and many adults, and yet when it is cooked properly it is a magnificent vegetable and a key ingredient in many classic and modern dishes. Spinach is related to the beetroots (beets) and chords and not to the cabbages or lettuces, to which it bears a superficial resemblance, it was first cultivated in Asia by the Persians, and it spread along the trade routes to China and eventually to Spain by the 11th century. It was five centuries later than it arrived in Britain. Spinach is really a plant for a cool climate. It dislikes hot, dry summers, when it will very quickly go to seed, often before it is fully developed and ready to harvest. However, if you make sure that your plants are properly watered and that you select cultivars that suit your area, you can pro­duce a crop that should last for two or three weeks and, with successional cropping, this can be extended considerably. The plants look rather like a loose lettuce, with stalked leaves rising from a central stem. When the plant bolts, this stem quickly elongates. Supplying the plant with plenty of moisture and nourishment can postpone the tendency to bolt. Spinach has a relatively short life, especially in hot, dry summers, when it is likely to bolt, and so many gardeners (erroneously one can’t help feeling) think it is not worth growing. There are other vegetables that are cooked in the same way as spinach and have the advan­tage of having a longer season. These are gen­erally known as “perpetual spinach”, and the chief of them is Swiss chard. 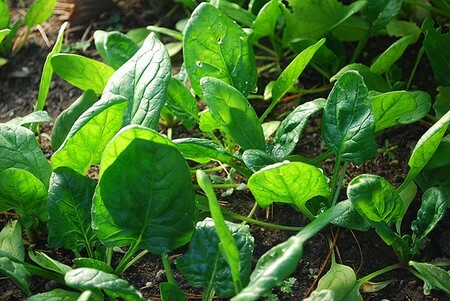 Another good alternative is New Zealand spinach (Tetragonia tetragonioides), which is not related botanically to spinach but makes a good sub­stitute, both in the garden and kitchen. It is grown as an annual, but unlike true spinach it can be picked throughout the summer months and also way into autumn. Sow in trays or modules under glass and plant out after the danger of frosts has passed. Alterna­tively, station sow at 45cm/18in intervals in shallow drills, 1 cm deep, where they are to grow, again alter the last frosts. It is more tolerant of drought than spinach but it does best if watered during dry periods. Pinch out the tip to make it bush out and harvest the leaves when they are big enough. Carry on doing this for as long as the plants last. Do not allow them to set seed or they may self-sow and possibly keep coming up for several years. The young leaves of red orache or red mountain spinach (Atriplex hortensis) can also be used in the same way. In spring, sow seed where they are to grow either in shallow drills or by broadcasting. Thin to 30cm/12in apart. It is worth growing in a potager for its decorative qualities alone. 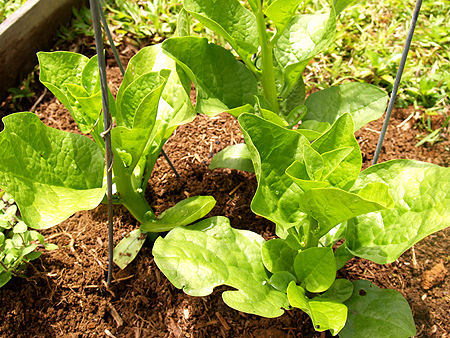 Grow spinach in an open, sunny position but preferably one that does not get too hot. The soil should be fertile and contain as much organic material as possible so that it is moisture retentive. Permanently wet soils should be avoided, however. Dig in manure or compost in autumn. Thinly sow the seed in early spring, with successional sowings at two-week intervals through to late spring. It is better to sow several short or part-rows at intervals than one long one if there is the possibility that most of the plants will run to seed before they are harvested. Sow in shallow drills, about 1 cm deep and 30cm apart. As soon as the seedlings are big enough to handle, thin them out to 15cm apart. Keep well watered and keep weeds under control. A crop for overwintering can be sown in late summer or early autumn. This will benefit from being covered with cloches from autumn onwards. The cloches will not only protect the plants, but will keep the leaves lender. Start harvesting as soon as the leaves are big enough, which is usually 8-12 weeks alter sowing. Don’t strip the plant, but just take a few leaves to start with and until the plains are mature. Break or cut the stems, but avoid pulling because ibis may loosen the plant and precipitate bolting. Continue harvesting until the plants start to run to seed — when the central stem starts to elongate. When harvesting winter spinach, do not overpick. Spinach should be picked and used as fresh as possible because it does not store. The leaves can, however, be frozen. Spinach should be grown so fast that there can be few problems (apart from bolting) and, in any case, there is little time for the gardener to satisfactorily correct any problems that do occur. The best solution in this case is to scrap the affected plants and start again. To avoid slug damage, clear the ground of slugs before sowing and at regular intervals thereafter. The most likely diseases to affect spinach are downy mildew (choose resis­tant varieties) and spinach blight. Destroy the affected plants. How To Search Missed Friends for a Reunion?